Officially, unemployment in the US is declining. It’s fallen from a high of 9.1% a couple years ago, to 7.8% in recent months. This would be good news, if the official unemployment rate measured unemployment, in the everyday sense of the word. It doesn’t. The technical definition of “U3” unemployment, the most commonly reported figure, excludes people who’ve given up looking for work, those who’ve retired early due to market conditions, and workers so part time they clock in just one hour per week. Most critically, unemployment excludes the 14 million American on disability benefits, a number which has quadrupled over the last 30 years. If you include just this one segment of the population in the official numbers, the unemployment rate would double. On Saturday, This American Life devoted their entire hour to an exploration of this statistic. Russ Robert’s, who’s podcast I’ve recommend in the past, discussed the same topic last year. Despite the magnitude of the program and the scale of the change, these are the only outlets I know of to report on the disability number, and on the implications it has for how we interpret the decline in U3 unemployment. Statistics, in the sense of numerical estimates, are measures which attempt to condense the complex world of millions of people into a single data point. Honest statistics come with margins of error (the most honest indicate, at least qualitatively, a margin of error for their margin of error). But even the best statistical measures are merely symptoms of some underlying reality; they reflect some aspect of the reality as accurately as possible. The danger with repeated presentations of any statistic (as in the quarterly, monthly, and even hourly reporting of GDP, unemployment, and Dow Jones averages), is that we start to focus on this number by itself, regardless of the reality it was created to represent. It’s as if the patient has a high fever and all anyone talks about is what the thermometer says. Eventually the focus becomes, “How do we get the thermometer reading down?” All manner of effort goes into reducing the reading, irrespective of the short, and certainly long-term, health of the patient. When politicians speak about targeting unemployment figures, this is what they mean, quite literally. Their goal is to bring down the rate that gets reported by the Bureau of Labor Statistics, the number discussed on television and in every mainstream source of media. Politicians focus on high profile metrics, and not the underlying realities, because the bigger and more complicated the system, the easier it is to tweak the method of measurement or its numeric output, relative to the difficulty of fixing the system itself. Instead of creating conditions which allow for growth in employment (which would likely require a reduction in politicians’ legislative and financial powers), the US has quietly moved a huge segment of its population off welfare, which counts against unemployment, and into disability and prisons — the incarcerated also don’t count in U3, whether they are slaving away behind bars or not. Over time, all social metrics diverge from the reality they were created to reflect. Sometimes this is the result of a natural drift in the underlying conditions; the metric no longer captures the same information it had in the past, or no longer represents the broad segment of society it once did. For example, the number of physical letters delivered by the postal service no longer tracks the level of communication between citizens. Statistics and the reality they were designed to represent are also forced apart through deliberate manipulation. Official unemployment figures are just one example of an aggressively targeted/manipulated metric. Another widely abused figure is the official inflation rate, or core Consumer Price Index. This measure excludes food and energy prices, for the stated reason that they are highly volatile. Of course, these commodities represent a significant fraction of nearly everyone’s budget, and their prices can be a leading indicator of inflation. The CPI also uses a complex formula to calculate “hedonics,” which mark down reported prices based on how much better the new version of a product is compared to the old one (do a search for “let them eat iPads”). I don’t see it as a coincidence that unemployment and inflation figures are among the most widely reported and the most actively manipulated. In fact, I take the following to be an empirical trend so strong I’m willing to call it a law: the greater the visibility of a metric, the more money and careers riding on it, the higher the likelihood it will be “targeted.” In this light, the great scandal related to manipulation of LIBOR, a number which serves as pivot point for trillions of dollars in contracts, is that the figure was assumed to be accurate to begin with. Often the very credibility of the metric, built up over time by its integrity and ability to reflect an essential feature of the underlying reality, is cashed in by those who manipulate it. Such was the case with the credit ratings agencies: after a long run of prudent assessments, they relaxed their standards for evaluating mortgage bundles, cashing in on the windfall profits generated by the housing bubble. It might seem like the disconnect between a statistic and reality would cause a dissonance that, once large enough to be clearly visible, would lead to reformulation of the statistic, bringing it back in line with the underlying fundamentals. Clearly there are natural pressures in that direction. For example, people laid off at the beginning of a recession are unlikely to believe that the recovery has begun until they themselves go back to work. Their skepticism of the unemployment figure erodes its credibility. Unfortunately, two powerful forces work against the re-alignment of metric and reality: the first related to momentum and our blindness to small changes, the second having to do with the effects of reflexivity and willful ignorance. In terms of inertia, humans have a built-in tendency to believe that what has been will continue to be. More sharply, the longer a trend has continued, the longer we presume it will continue — if it hasn’t happened yet, how could it happen now? Laplace’s rule of succession is our best tool for estimating probabilities under the assumption of a constant generating process, one that spits out a stream of conditionally independent (exchangeable) data points. But the rule of succession fails utterly, at times spectacularly, when the underlying conditions change. And underlying conditions always change! These changes, when they come slowly, pass under our radar. Humans are great at noticing large differences from one day to the next, but poor at detecting slow changes over long periods of time. Ever walked by an old store with an awning or sign that’s filthy and falling apart? You wonder how the store owner could fail to notice the problem, but there was never any one moment when it passed from shiny and new to old and decrepit. If you think you’d never be as blind as that shop keeper, look down at your keyboard right now. As with our environment, if the gap between statistic and reality changes slowly, over time, we may not see the changes. Meanwhile, historical use of the statistic lends weight to it’s credibility, reducing the chance that we’d notice or question the change — it has to be right, it’s what we’ve always used! The perceived stability of slowly changing systems encourages participants to depend on or exploit it. This, in turn, can create long term instabilities as minor fluctuations trigger extreme reactions on the part of participants. Throughout the late 20th century and the first years of the 21st, a large number of investors participated in the “Carry Trade,” a scheme which depended on the long term stability of the Yen, and of the differential between borrowing rates in Japan and interest rates abroad. When conditions changed in 2008, investors “unwound” these trades at full speed, spiking volatility and encouraging even more traders to exit their positions as fast as they could. These feedback loops are an example of reflexivity, the tendency in some complex systems for perception (everyone will panic and sell) to affect reality (everyone panics and sells). Reflexivity can turn statistical pronouncements into self-fulfilling prophecies, at least for a time. The belief that inflation is low, if widespread, can suppress inflation in and of itself! If I believe that the cash in my wallet and the deposits in my bank account will still be worth essentially the same amount tomorrow or in a year, then I’m less likely to rush out to exchange my currency for hard goods. Conversely, once it’s clear that my Bank of Zimbabwe Bearer Cheques have a steeply declining half-life of purchasing power, then I’m going to trade these paper notes for tangible goods as quickly as possible, nominal price be damned! If perception can shape reality, then does the gap between reality and statistic matter? Clearly, the people who benefit most from the status quo do their best to avoid looking down, lest they encourage others to do the same. 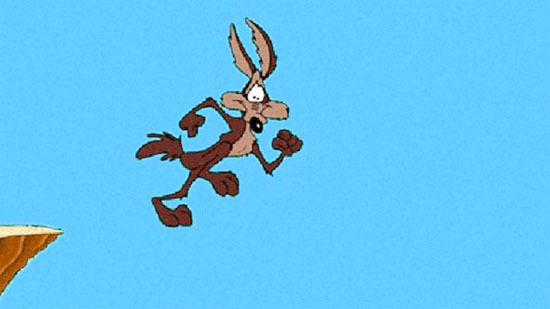 More generally, though, can we keep going forward so long as we don’t look down, like Wile E. Coyote chasing the road runner off a cliff? The clear empirical answer to that questions is: “Yes, at least for a while.” The key is that no one knows how long this while can last, nor is it clear what happens when the reckoning comes. Despite what ignorant commentators might have said ex post facto, by 2006 there was wide understanding that housing prices were becoming un-sustainably inflated. In 2008, US prices crashed back down to earth. North of the border, in Canada, the seemingly equally inflated housing market stumbled, shrugged, then continued along at more level, but still gravity-defying trajectory. Even as the pressures to close the gap grow along with its size, the larger the divergence between official numbers and reality, the greater the pressures to keep up the facade. If the fictional single entity we call “the economy” appears to be doing better, politicians get re-elected and consumers spend more money. When the music finally stops, so too will the gravy-train for a number of vested interests. So the day of reckoning just keeps getting worse and worse as more and more resources go into maintaining the illusion, into reassuring the public that nothing’s wrong, into extending, pretending, and even, if need be, shooting the messenger. It’s not just politicians and corporations who become invested in hiding and ignoring the gap. We believe official statistics because we want to believe them, and we act as if we believe them because we believe that others believe them. We buy houses or stocks at inflated prices on the hope that someone else will buy them from us at an even more inflated price. My (strong) belief is that most economic and political Black Swans are the result of mass delusion, based on our faith in the quality and meaning of prominently reported, endlessly repeated, officially sanctioned statistics. The illustration at the beginning of this post comes from a comic I authored about a character who makes his living off just this gap between official data and the reality on the ground, a gap that always closes, sooner or later, making some rich and toppling others. This entry was posted on Wednesday, March 27th, 2013 at 10:20 am	and is filed under epistomology, feature, predictions, stats. You can follow any comments to this entry through the RSS 2.0 feed. You can leave a comment, or trackback from your own site. Some people say you can plot the data to the cycles of your washing machine and get good stats. We should try that with U3. Great article Matt. Would love to see a simulation based on unemployment and disability statistics. Agree with that. One example being the body count in Vietnam. Have you looked at Paul Solman’s blog (http://www.pbs.org/newshour/economy/makingsense/)–he tracks a number of alternative versions of the unemployment statistic, though I don’t think including disability. Rather than including disability in the unemployment metric, I think I’d prefer a separate metric, which also considers other factors, such as institutionalization. I’ve seen discussions that the deinstitutionalization of the mentally ill in the US in the 1960’s/70’s should be paired with prison populations when considering the overall picture. Another forged numbers that plague public space and have impact on public opinion of those, who don´t really understand what term variable means. I know why on the first page of my study book for statistics, there was written: Statistic is a scientifically approved lie. Great danger for the current capitalist world-system is to show the low and middle class people the real numbers about their welfare. It´s just better to keep paying them social security or another type of government benefits, while keeping them religious and proudly ignorant. The question is how long this can be maintained without being punished? I´m so glad we still have an active civil society on the watch, which never fails to provide reliable source of information, because corporate media only copy paste information from the government without properly thinking about them. I´m from Canada and we have the same situation over here. March was one of the worst months and many people even in the urban areas start to fear for their jobs. Housing market affordability increased to surreal numbers, as well as piles of debt. But we are being constantly encouraged to take more debt, even though we will probably die one the street when we stop working. Our reality is like a rat race. Do you think using something like the civilian labor force participation rate would be a more accurate gauge for unemployment? It seems to be the “go to” stat for some who have become sick of the inaccurate U3 numbers. Ideally, an accurate measurement of how many people are un- and under-employed, in the sense that we generally understand these terms, is what we want. This gives more insight into economic conditions than the participation rate, which tracks broad demographic trends.